Although my novel, Prairie Hill, is not about baseball, it includes scenes at a vintage minor league baseball stadium. I’ve always loved the game, from playing typical sandlot contests in my childhood, to playing catch with my brother Jeremy and countless friends over the years, to keeping my ears glued to Phillies games on the radio when I should have been doing my homework, to rooting for the Beloit Snappers here in Wisconsin. 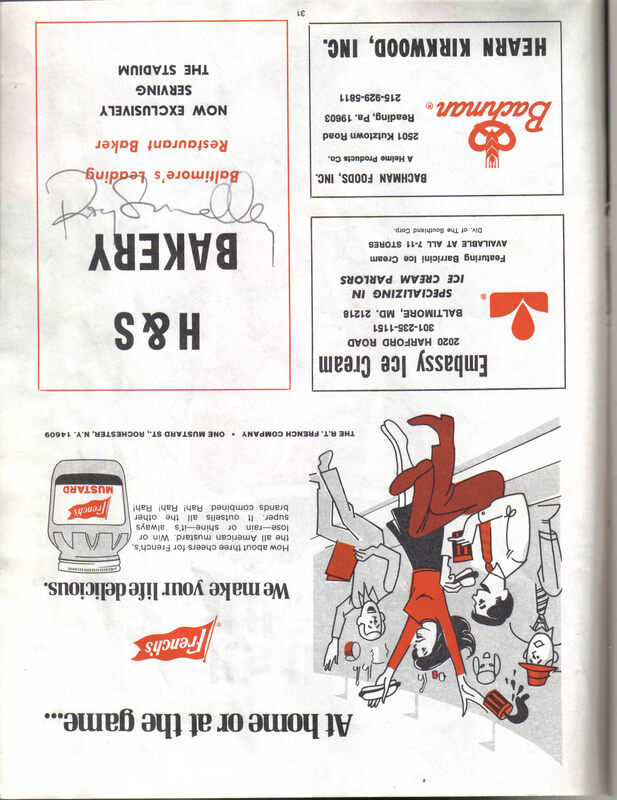 Back in the early 1990’s I wrote a piece about a rather special game I attended with some friends in June 1975, between the Baltimore Orioles and the Texas Rangers. “Rain Dance” first appeared in slightly different form in Fan: A Baseball Magazine #15 Spring 1994. The rain spattered the empty seats and the concrete steps. When thunder cracked louder than a broken bat, the crowd, the vendors, and the players all moved back to shelter. The grounds crew spread the tarp and the umpires watched the sky. Pete, Mark, and I reluctantly stood near one of the ramps, along with dozens of others, feeling steamy in the stifling air. When the rain let up a little, we walked down to the fence near the visitors’ dugout where a few Texas Rangers emerged. They were beating the Baltimore Orioles and seemed pretty happy about that, joking with each other, laughing. The PA system blasted an Elton John song and then “Thank God I’m a Country Boy,” by John Denver. One Texas player, a shaggy-haired young guy, began to dance a jig as he played catch. 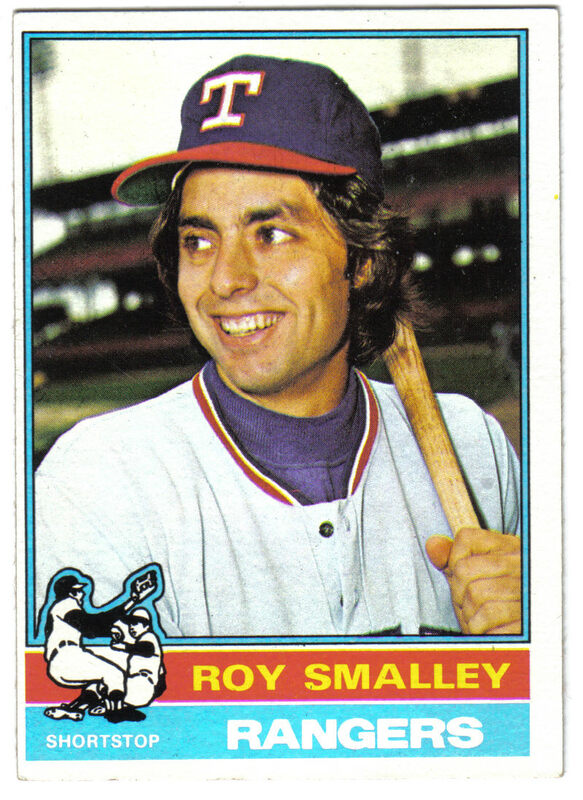 His name was Roy Smalley, a recent call-up from Triple A Spokane. We watched the rookie shortstop knock off second baseman Lenny Randle’s cap and then run away at top speed. Randle, one of the game’s speedsters, kept a poker face, plopped down next to his cap, and stretched. “Can we have your autograph?” Arms stretched out. Scorecards riffling in the wind. I got up my courage and leaned over the fence. “Nice hit,” I called out. “How do you like the majors?” asked Pete. He jogged off and we watched as he horsed around with some others, imitating their fielder’s crouches and batting stances. He had as much energy as a little leaguer at his first game. The bright, artificial light poured down on the glistening grass as men unfurled the tarps. The Public Address announcer reported that the game would resume, so we hiked up the aisle and slid back into our seats. A light drizzle fell, almost a mist, but the players warmed up in earnest, pitcher toeing the dirt around the mound, infielders whipping the ball back and forth across the field. Then it began to rain harder. Rumbling thunder. Zigzagging lightning. Those still huddled in the stands held scorecards and yearbooks over their heads and raced for the exits. The retreating umpires called the game after only four innings, wiping it from the official records. Too bad Roy Smalley’s hit wouldn’t count, I thought. As Roy stepped back toward the dugout, he turned again, smiling, faked a hit, and waved. Postscript: Nearly thirty-seven years later, I still have his scrawled pencil signature on a scorecard page crinkled from rain. I was so impressed by Roy Smalley’s generosity to a few bedraggled teenage fans, that I wrote a letter, thanking him. 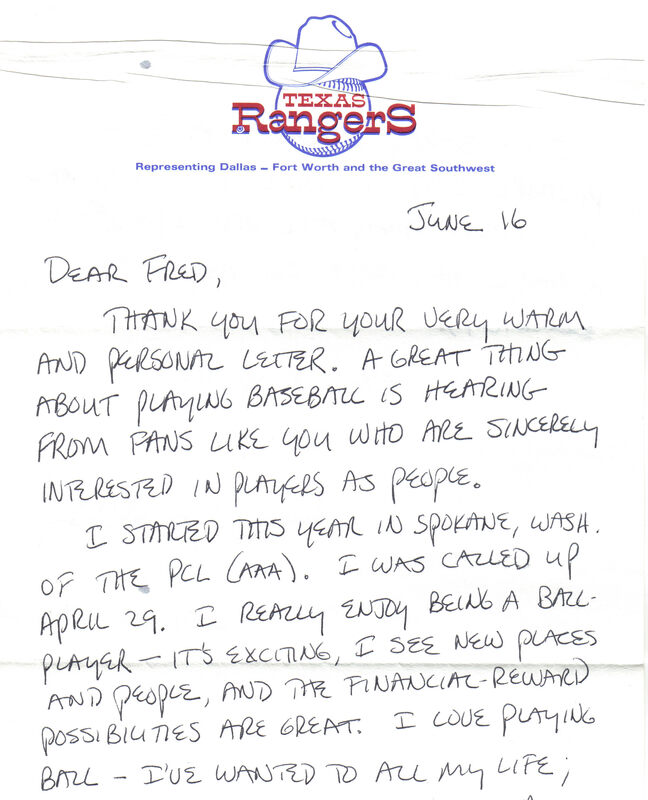 A short time later I received a personal response on Texas Rangers stationery. From then on, I followed Roy as he played for the Twins, Yankees and White Sox through 1987 when he retired after playing in the World Series, topping off a fine career featuring 1,454 base hits and 163 home runs.